My latest blog post is titled Social Media Examples: Car Dealers. It explores how the automobile industry, a needs-based industry - as are many nowadays - has traditionally communicated with customers and how social media could change customer dynamics and connections -- particularly at the dealer level. After all, dealers - be they car dealers or flooring dealers - depend on customer relationships for success. My latest blog article is live and addresses Waiting Time and making better use of it to connect with customers. I bet you have interesting examples - good and bad - you've come across. Read Connecting with Customers: Maximize Waiting Time and let me know how you might take a negative - waiting around - and transform it into a positive. By the way, you might also enjoy reading last week's Retail Experience in the News links for 12/2/11. Have you thought how your in-store retail experience relates to your online experience? In Retail Experience Evolution: In-Store and Online I offer one scenario, inspired by last week's blog article. Simply click on the click to read about Retail Experience Evolution. I'd love to hear your suggestions and observations. I'm delighted to share with you an interview with Manny Llerena, 30 year flooring veteran, who discusses with me the retail experience and marketing to women. Please click on Marketing to Women, the Retail Experience, Manny Llerena and Flooring to read the entire interview. P.S. : For those of you in the U.S., Happy Thanksgiving! 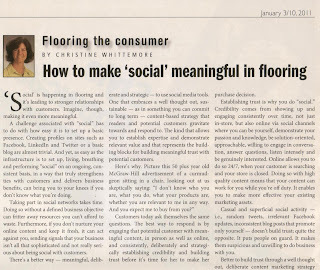 If you'd like to read my latest Flooring The Consumer article, please click on Customers Want Solutions From The Retail Experience. How does what I describe compare to your experience? Do you see differences based on whether your experience is online or in-store? What is your most remarkable experience? Oh, and which retailers stand apart in your mind? I've just published two weeks worth of Retail Experience in the News... recapping the latest articles and links shared on Twitter with the #retailexp hashtag this past week. Simply click on Retail Experience in the News: 11/11/11 for your special fix! Retail Hospitality Inspired by "Good Tea. Nice House." In one of my very early posts - "Good Tea. Nice House. 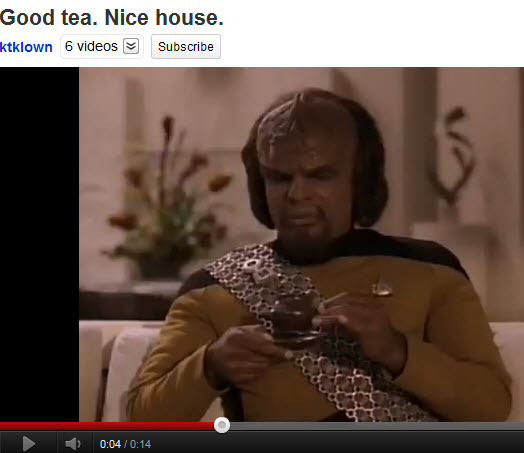 "- I brought up this priceless moment with Worf from Star Trek: The Next Generation. In Hospitality, Trust and the Retail Experience, I explore the important role that hospitality plays in building trust with potential customers. Without trust, there can be no commercial transactions. Note: special thanks to Drew McLellan for his comment - one of my very first! - on the original post. A special Thank You to Joseph Michelli, fellow Zappos and Bathroom Blogfest enthusiast, for sharing with us his thoughts about "Online, Phone, Email, Brick and Mortar – What all Great Customer Experiences have in Common" with special emphasis on the Zappos Experience. Please read his 5 experience principles to WOW! 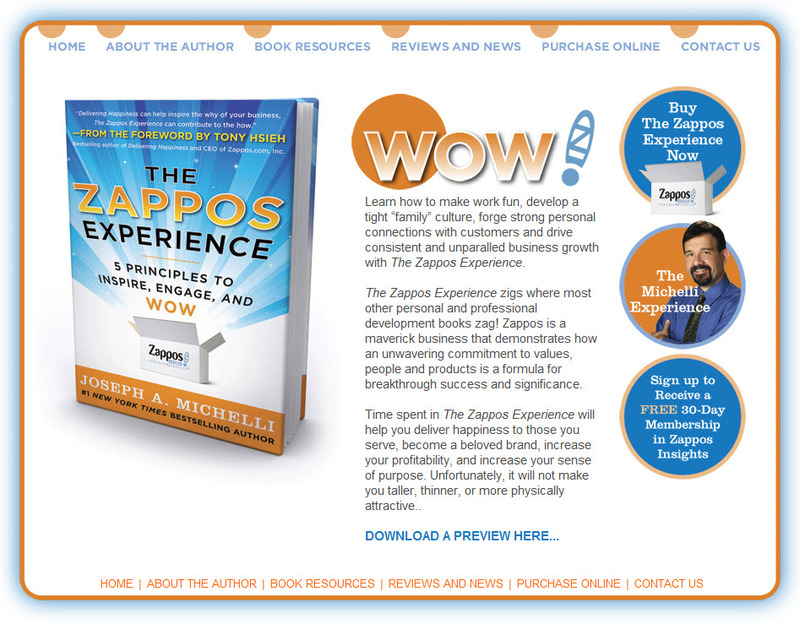 your customers by clicking on Wow Your Customers, Starting with The Zappos Retail Experience. P.S. : If you haven't already, do check out Joseph's Bathroom Blogfest 2012 blog article titled You’ve been Faced at the Bathroom Blogfest 2011 based on a visit to Zappos. Amazing - the last day of September already and time the 9/30/11 issue of Retail Experience in the News... recapping the latest articles and links shared on Twitter with the #retailexp hashtag this past week. Innovation lessons imported from Detroit: http://ow.ly/6EjvJ - applicable to #retailexp! Becky Carroll's new book, The Hidden Power of Your Customers: 4 Keys to Growing Your Business Through Existing Customers, is a must read for any business person serious about growing his or her business. Why? Because Becky focuses intensely on how to build customer loyalty. If you're serious about the success of your business, you need a loyal customer base. R: Relevant marketing – Organizations need to market to their customers in a way that is relevant to them, including recognizing them as customers, using their language, and meeting their needs. O: Orchestrated customer experience – Every place a customer interacts with a company needs to provide a consistent, planned experience for the customer that is beneficial to both parties. We can’t leave the customer experience to chance. C: Customer-focused culture – We can’t just expect that a company will become customer-centric because it hires a few great customer service personnel or states that it cares about customers in its marketing. We need to ensure that customers are part of everything that our company does so that customer-focus becomes part of the company DNA. K: Killer customer service – Companies need to take customer service to the next level, and it needs to be an integral part of the customer experience. Customer service is where the rubber meets the road, as many buying and renewal decisions are based upon this critical touch point. It has to ROCK." In addition to detailing the ROCK framework, the book offers guidelines for listening to and determining the customer point of view. Becky then integrates all of the elements to demonstrate how a ROCK based approach to business drives growth. I particularly enjoyed the range of examples of customer-focused companies that Becky includes in her book - from well known and lesser known companies. Case studies explore best practices from Teradata, Sanuk, Marriott Rewards, Lexus, Urbane Apartments, EMC, Southwest Airlines, Salon Radius and Mighty Fine Burgers representing a wide range of industries and specialization. In addition to these in-depth case studies, she weaves in throughout the book references to other best practices, including ones based on personal experiences. Some of those include Beaver Creek Resorts, Ravenswood, Disney, Spiceworks, Jones Soda and Verizon to name just a few. With each example, Becky highlights tips and advice on how to unleash the power of your customers. Be human. Be sincere. Listen to your customers. Internalize a customer focused attitude to inspire you and your organization! The methodical format means that you can readily figure out what's broken and how to fix it so you can delight customers and grow your business. Two quotes from the book to think about: "it can take up to 12 positive interactions to overcome a single negative one," from page 200 and the Golden Rule for Customers: "it's not who's right, it's what's right" from page 205. Doesn't it seem a lot easier and more productive to focus on the hidden power of your customers and delight them intensely? To order Becky Carroll's book, click on The Hidden Power of Your Customers. Lisa Petrilli in The Hidden Power of Your Leadership to Create Raving Fans used The Hidden Power of Your Customers as the backdrop for a #LeadershipChat discussion with Becky. Note: Becky forwarded me a free copy of her book. She also included me in the book's acknowledgements. Here is the 9/23/11 issue of Retail Experience in the News... recapping the latest articles and links shared on Twitter with the #retailexp hashtag this past week. Greetings! I share with you the 9/16/11 issue of Retail Experience in the News... recapping the latest articles and links shared on Twitter with the #retailexp hashtag this past week from Boston where I'm absorbing Inbound Marketing Wisdom and attending the Hubspot User Group Summit. Happy weekend! Netflix tweaks its #retailexp model: http://ow.ly/6tAdP How much effect will changes have? In the spirit of A Fun Digital Retail Experience: HEMA, I share with you the IKEA Happy To Bed campaign from the UK. Have you come across it yet? Go to IKEA on YouTube UK [p.s., if you scroll down on the YouTube page, you'll come across a video of a pillow fight - also part of the campaign]. Next, you can connect to your Facebook profile, select personas for your room and watch a fun virtual interpretation of what 'happy to bed' would look like for you. 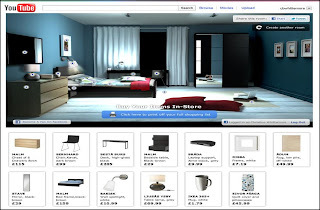 IKEA's press release describes the result as the "first ever personalised 3D showroom on YouTube. Drawing on information from Facebook, IKEA’s tool creates a bespoke 3D bedroom that can then be explored and tailored by users to create their perfect bedroom." First, I chose to focus on a room for a partner and me, dialed how long we had been together and ... voila! Note the oval on the left: that is where this application selected pictures from my Facebook profile and included them in pictures frames in my virtual bedroom. Very clever. Next, I decided to focus selfishly just on myself. I found those results much more interesting, with lots more photos relevant to me: a photo above the headboard, on my laptop screen and on the wall. 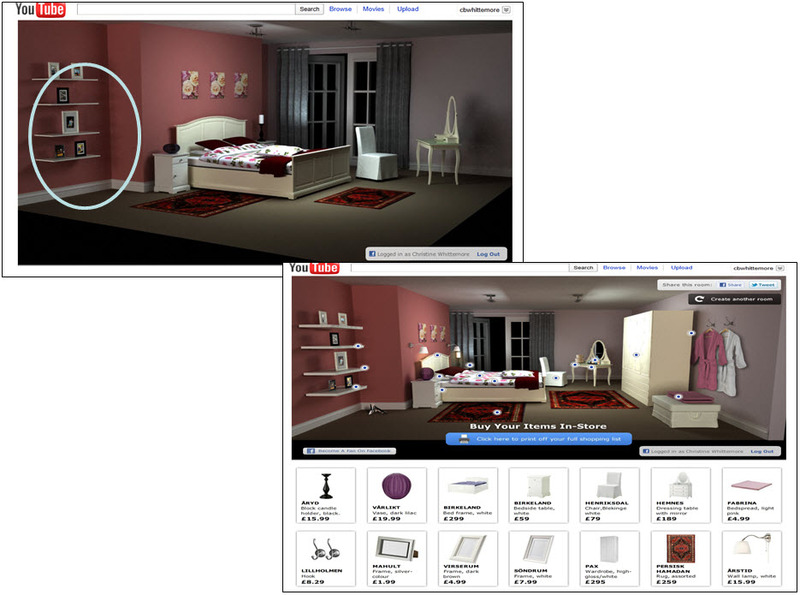 For all selections, your perfect IKEA room visualizer comes with items in the room identified. Per the release, you have "the ability to see detailed product information and to click through to IKEA.co.uk to purchase any home furnishings featured within the bedroom." Creating bedrooms that support TV and internet for those most likely to use it. Incorporating workspace to reflect the growing trend of working in the bedroom. Smart storage solutions to address the decline in living space across the United Kingdom. Helping customers see the potential to create a happier space in their bedrooms for a better night’s sleep. IKEA have used the results as part of a £2.5million investment into redesigning the bedroom roomsets in stores across the country. The redesigns will ensure all IKEA bedroom roomsets are locally relevant, specifically reflect the way people live their life at home and showcase the solutions that help people go to bed happy." I found the "Happy To Bed" IKEA online retail experience absolutely fascinating and enjoyed interacting with it. The personal touches, in particular, are brilliant! So much so that I wanted to spend more time with them. The flash video format allows you to watch the video, but not to rewind or go back or slow down the viewing. The only way to repeat the viewing is by starting all over again and rebuilding one's room. Couldn't this be a rewindable video? I love that IKEA has taken research about consumer trends to develop rooms relevant to local preferences and would love to know how the program is affecting sales of these various bedroom products. What is your reaction to 'Happy To Bed'? As a consumer as well as a retailer? What do you like and not like? P.S. : 'Happy To Bed' is best viewed in Firefox. It has issues in Chrome. Here is the 9/9/11 issue of Retail Experience in the News... recapping the latest articles and links shared on Twitter with the #retailexp hashtag this past week. I love reports about future of home spaces. This from IFDA: http://ow.ly/6lkGA Reactions? How will this affect #retailexp? I haven't had a chance to share with you news about Simple Marketing Now in a while. However, I did want to let you know that last week, despite all of the Hurricane Irene Internet issues we experienced, I published the September 2011 issue of Simple News & Insights! You'll also find an offer I put together for readers of the newsletter... two social media marketing guides [more details in the newsletter]. 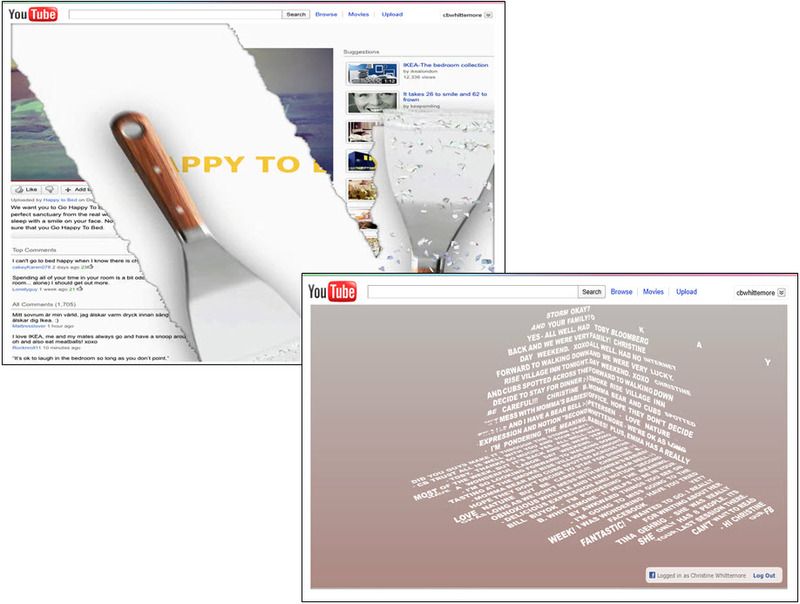 To read the September 2011 issue of Simple Marketing Now's eNewsletter, click on this link. I can't wait to hear your comments - both on the newsletter and on the social media marketing guides. Let me know, too, if you like the changes I've made to the Simple Marketing Now website. P.S. : I hope you had a wonderful Labor Day weekend! Happy Labor Day weekend to you in the US! Here is the 9/2/11 post-Irene issue of Retail Experience in the News... recapping the latest articles and links shared on Twitter with the #retailexp hashtag this past week. Becky Carroll from Customers Rock! 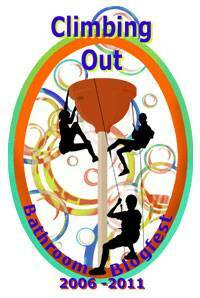 has great news to share! She has just published The Hidden Power of Your Customers: 4 Keys to Growing Your Business Through Existing Customers , her first book! It celebrates the 'customers rock!' attitude which is all about customer centricity and realizing that customers represent valuable company assets. Becky has shared her passion with us several times, most recently in Customer Loyalty & Social Media: Customers Rock Video Series and in Becky Carroll On Bridging New & Old: Social Media Series. 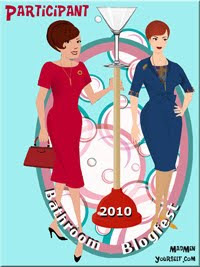 She's also an original Bathroom Blogfest participant! In honor of her book, not only do I have an interview with Becky Carroll to share with you, but... Becky has sent me a copy to give away to a Flooring The Consumer reader! Very cool. And, now, my interview with Becky Carroll, author of The Hidden Power of Your Customers! C.B. : Becky, congratulations on your new book! Tell us about your background and work experiences and how those led to your passion for customers and your amazing Customers Rock! attitude? BC: I have been customer-focused for most of my 20+ year career. It started with nearly 14 years at HP, where I was in charge of the worldwide customer loyalty program for HP Services. My passion for customers continued as I worked with Don Peppers and Dr. Martha Rogers at Peppers & Rogers Group as a senior consultant for companies such as Ford, HP, and Electronic Arts. I have had my own company, Petra Consulting Group, for nearly 6 years helping companies focus on the customer experience and how to improve customer relationships with social media (and other methods). I really think, though, that my biggest influence on my Customers Rock! attitude was probably HP’s founders, Bill Hewlett and Dave Packard. I was fortunate enough to work at HP when they were both wandering the halls of the company and showing us what it meant to care about others – employees first, then customers. That is why I started my Customers Rock! 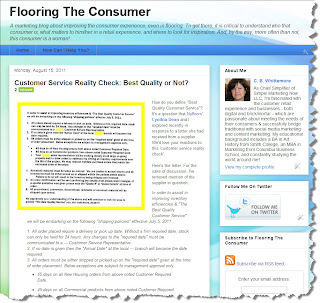 blog back in 2006, to share the positive strategies companies are using to delight their customers and create rockin’ customer experiences. C.B. : What is most critical about growing your business through customers? 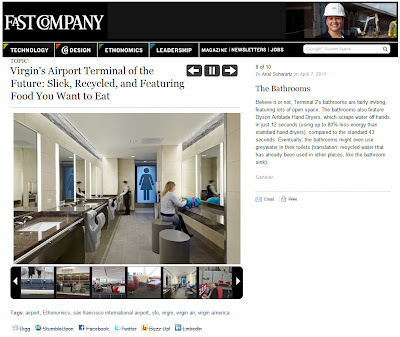 BC: The most critical thing is not taking your existing customers for granted. Today’s companies are so busy trying to woo new customers with deals that don’t apply to the current customer base, or are striving to gain new social media followers that they have forgotten to let their customers know how much they appreciate them. In fact, based on their company’s business metrics, they probably don’t appreciate them. This may seem like a no-brainer (you know, a bird in the hand and all that), but there are still so many companies that are not applying the principles found in the four keys in my book. It isn’t really hard – it just takes a deliberate plan to make it happen! Why don’t all companies get this? Not all companies get this partly because they ignore their current customers, as mentioned above. Additionally, many think that “great customer service” is enough to retain customers. It isn’t. Anyone can provide great customer service. From interviewing executive of top-performing companies for my book, I found consistencies across them all. Companies that have a Customers Rock! attitude all have customers “in their DNA”. They speak to customers via the method they prefer, they carefully consider each interaction in the customer’s experience with their business, they create a customer-focused culture, AND they have killer customer service. All of this is part of the strategy to unlock the hidden power of their customers – and it works. C.B. : You weave social media throughout the book – as it should be throughout a company’s marketing and customer service strategies. What prevents companies from doing so? BC: Many companies look at social media as only another place to run PR and marketing campaigns. In so doing, they are missing out on the sweet spot for social media – customer retention and loyalty. Social media isn’t just about listening to social media chatter or “being part of the conversation”. It is more than a way to reactively respond to customer issues voiced in this channel. It is a way to learn about your customers and their needs, then apply those insights to helping to meet those needs and growing customer relationships. C.B. : What’s ahead for launching & promoting The Hidden Power of Your Customers? BC: I will be speaking at several customer-focused events this fall as part of my book tour. I would be happy to consider expanding my book tour if any of your readers are interested in bringing me to their part of the country/world! In addition, I have been working with several influential bloggers (such as you, CB!) and have given them each a copy of the book for themselves, as well as one to give away to their readers to help build buzz. Of course, I am sharing about the book in my Customers Rock! blog and with my UC San Diego students, as both of these groups of people helped encourage me to write the book as Wiley approached me about it. Social media is definitely the main promotion engine for this book! C.B. : Becky, how can people connect with you? BC: They can connect through my blog Customers Rock!, Twitter @bcarroll7 and Facebook on The Hidden Power of Your Customers Fan Page. I've also created a page on my blog for The Hidden Power of Your Customers. To purchase Becky's book, click on The Hidden Power of Your Customers: 4 Keys to Growing Your Business Through Existing Customers. I'm also honored that you mention me in the Acknowledgements. Thank you. Readers, let me know in the comments what comes to mind when you think about the hidden power of your customers! Here is the 8/26/11 issue of Retail Experience in the News... recapping the latest articles and links shared on Twitter with the #retailexp hashtag this past week. Only 6% of US mobile audience uses QR Codes, mostly men: http://ow.ly/68mYD #retailexp So relevant! This company has been looking at what they do to provide goods as a negative and as a nuisance instead of an essential part of the goods and services they should provide with a smile. This is a company I would not do business with. Today's consumer is in the driver's seat with multiple sources for similar or identical products. The keys to happy consumers are service, responsiveness, flexibility, and a smile. Purchasing must be easy. Delivery must be convenient for the consumer. Delivery people must be clean, courteous, careful when in the customer's home or business, and engaging. Every person working for the supplier is an ambassador for the company and must act accordingly. I think of Ironware International owned by Karin Eaton (history and background on the site). She is remarkable, poised, and engaging. Here is the ordering page link http://www.ironwareinternational.com/content/orderingpolicies. Neutral language in clear sections cover all contingencies. The key is the showroom that works with the designer and creates the order. The local showroom is Sloan Miyasato. The person working with Ironware is Patrice and she is exceptional. Ironware realized that delivery times are shrinking as the clients of designers ask for interior design work to be completed in weeks not months. Karin responded by analyzing her sales and selecting 34 items that she guarantees to ship in 2 to 4 weeks. One finish and one style of each item is available for quick ship but this is what most orders have been for. Quick ship has been a big success for Karin and is typical of the changes in what had been a slow moving supply chain with long lead times. I now work at a major department store in the home department. Consumers are short tempered, and they want the lowest price (they are aggressive with coupons, price adjustments, and telling you what price they want to pay). This retailer has merged online and location ordering systems into one system. This system can be used to locate an item and can then ship the item (free shipping if order is $50.00 or more). The on line and location pricing does not always match and the store internet system is often not working. I often use customer's smart phones to check the web site to confirm a lower price. Example: a $150- item was on clearance at $16.00 from the warehouse plus $6.00 shipping. The customer objected to the $6.00 shipping charge and to my failure to apply a posted 10% additional discount (that was the next screen in the ordering process). I politely reminded her that she was buying a $150.00 item for less than $20.00 and she backed off. This happens thousands of times daily in 800 stores and this is one retailer. Some of this customer aggressiveness can be attributed to this retailer's bewildering number of coupons and offers, rebates, and cash back programs. Consumers are annoyed at the retailer and thus at me for items that do not qualify for a discount, at coupons that have expired, and at coupons with lots of small type (all of them). Yet, coupons, rebates, and special offers pack the stores with buyers. Service with a positive attitude, easy and free delivery, short or no delivery lead time, and a competitive price are what consumers are looking for. Multiple ordering channels are a must. 24 hour ordering is a must. Services are disappearing. Gift wrap is gone. Local stock of high end goods (fine china as an example) is mostly gone. Trained sales people with product knowledge is the exception and low pay is one of many reasons. Many consumer goods are the same or similar from retail store to retail store. Excitement and enchantment is mostly gone from retail. That's the report and response from California. In a followup message, Arthur refers us to Now what? UPS threatens to return my shipment, won’t let me correct address - a preposterous, real life story affecting a customer's service experience. What's your reaction to Customer Service Reality Check? How do you balance supplier and customer pressures in today's marketplace? What are you doing differently to deliver memorable customer service and customer experiences? The 8/19/11 issue of Retail Experience in the News... recapping the latest articles and links shared on Twitter with the #retailexp hashtag this past week is ready for you! Jos A Bank: interesting #retailexp success story: http://ow.ly/62TGm "we let the customer tell us" - Do You? Car sites turn to social media: http://ow.ly/62VGp Doesn't sound like the #retailexp had been reinvented tho. Simplicity the key to success for back 2 school mobile #retailexp: http://ow.ly/62U7z Note impo of having a strategy. 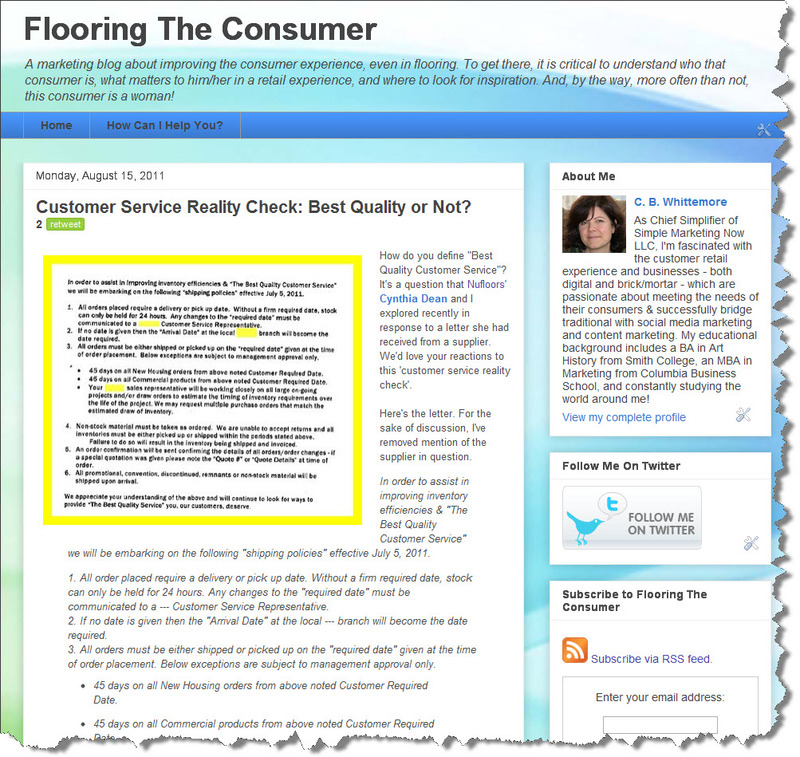 Customer Service Reality Check: Best Quality or Not? How do you define "Best Quality Customer Service"? It's a question that Nufloors' Cynthia Dean and I explored recently in response to a letter she had received from a supplier. We'd love your reactions to this 'customer service reality check'. Here's the letter. For the sake of discussion, I've removed mention of the supplier in question. 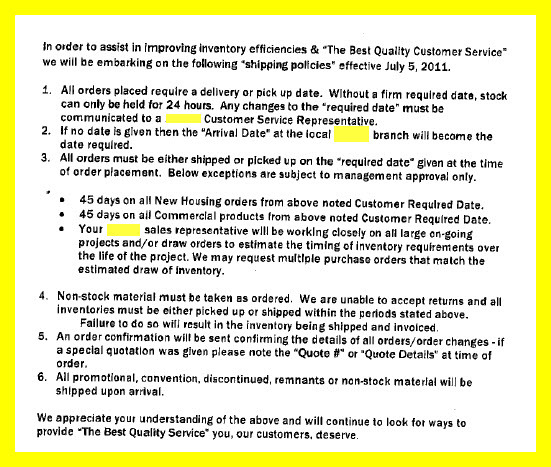 In order to assist in improving inventory efficiencies & "The Best Quality Customer Service" we will be embarking on the following "shipping policies" effective July 5, 2011. 1. All order placed require a delivery or pick up date. Without a firm required date, stock can only be held for 24 hours. Any changes to the "required date" must be communicated to a --- Customer Service Representative. 2. If no date is given then the "Arrival Date" at the local --- branch will become the date required. 3. All orders must be either shipped or picked up on the "required date" given at the time of order placement. Below exceptions are subject to management approval only. 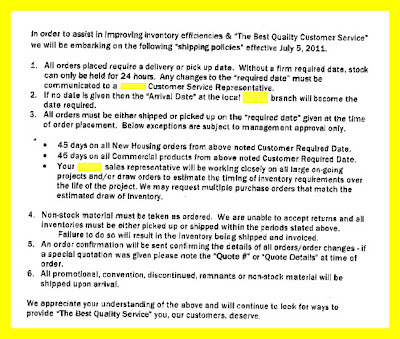 45 days on all New Housing orders from above noted Customer Required Date. 45 days on all Commercial products from above noted Customer Required Date. Your --- sales representative will be working closely on all large on-going projects and/or draw orders to estimate the timing of inventory requirements over the life of the project. We may request multiple purchase orders that match the estimated draw of inventory. 4. Non-stock material must be taken as ordered. We are unable to accept returns and all inventories must be either picked up or shipped within the periods stated above. Failure to do so will result in the inventory being shipped and invoiced. 5. An order confirmation will be sent confirming the details of all orders/order changes - if a special quotation was given please note the "Quote #" or "Quote Details" at time of order. 6. All promotional, convention, discontinued, remnants or non-stock materials will be shipped upon arrival. We appreciate your understanding of the above and will continue to look for ways to provide "The Best Quality Service" you, our customers, deserve. I am sending you the attached as an example of what not to do. This is a letter we received from one of our suppliers this week. Under the guise of ‘The Best Quality Customer Service’, they have implemented a long list of rules that we the customer now have to abide by ‘or else’. Lynn, our person who does product ordering asks the question ‘How come whenever the suppliers are making us do even more work to make their lives easier, they call it ‘Improving Customer Service’. I thought you would find this amusing (and maybe even a bit sad). The flooring industry is so far behind the times it is staggering. Enough from me, what is your take on this letter? How would you react? If you had to send out a similar communication, what would you do differently? How would you turn this message from bad medicine to truly best quality customer service?